One needn’t be well versed in classical music to appreciate listening to it, which is one of the reasons Taka Kigawa’s recitals are accessible. His most recent performance, at (le) Poisson Rouge on August 24, opened the worlds of Claude Debussy, Tristan Murail, and Marco Stroppa to a sold-out audience. Kigawa is a critically acclaimed concert pianist who doesn’t shy away from a complicated program. Last year he performed the complete solo piano works of Pierre Boulez on a world tour, and he once played The Art of Fugue by Johann Sebastian Bach without sheet music. For the first segment of his 2015 recital, he performed Debussy from memory, and it sparked images of a conversation with nature. 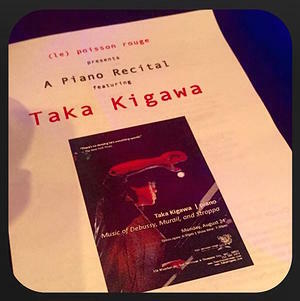 The French composer is known as the founder of musical impressionism – although he rejected that term – and the audience could feel that throughout Kigawa’s performance of Images, Books I and II. Debussy’s heavy use of scales brings to mind a furin, a Japanese wind bell whose sound resembles ice tinkling in a glass and provides aural relief from the sweltering summer heat of Japan. A Japanese lacquer painting inspired Debussy to compose Poissons d’or, which Kigawa describes in his notes as “a piece that captures splendidly the goldfish’s nimble and luminous character.” This piece provides another example of Debussy’s musical impressionism as it creates an image and an atmosphere through the use of scales and harmony. Kigawa broke out the sheet music for Territoires de l’oubli, a thirty-minute work by Tristan Murail, a French composer born in 1947. Wanting to explore the piano beyond the scope of a percussion instrument, Murail created a sprawling piece that is at times playful and light as well as ominous and heavy. Murail uses computers to assist in his composition and works with live electronics, as does Marco Stroppa, the Verona-born composer of Traiettoria . . . deviata, Kigawa’s final number in his recital. A Fullbright Scholar in the mid-1980s, Stroppa studied computer music and artificial intelligence at MIT’s Media Laboratory, and he replaces the orchestra for Traiettoria . . . deviata with electronic music, which was performed live at Kigawa’s recital by Rafael Valle. This piece gave an otherworldly finish to the recital, with Kigawa’s chords and scales mingling harmoniously with the sounds of what seemed to be a spaceship landing onstage or a soundtrack to a movie about aliens. But the music doesn’t alienate the knowledgeable patrons at (le) Poisson Rouge. Kigawa is not a flashy performer; he allows himself to become absorbed into the music and handles the keys with the precision of a master sushi chef slicing into the freshest fish with the best Japanese knife. And the (le) Poisson Rouge audience, undaunted by classical/contemporary/electronic music, absorbs the sounds with him.